I am sure by now you have heard or even seen the Dreamworks movie Trolls. We loved the Trolls movie and were pretty darn excited to see it. The characters are adorable and of course, we love Poppy. As with many new movies these days, an entire lineup of products get released and this is the case with the Trolls movie as well. After all, who wouldn’t want to play with these adorable troll characters? We loved Poppy in the movie as I am sure many did, so we were excited to check out the Trolls Hair in the Air Poppy doll. Put your hair in the air and light up the party! DreamWorks Trolls Poppy is the heroic leader, lifting the spirits of everyone around her with positivity and the belief that, with a song in your heart, you can do anything! 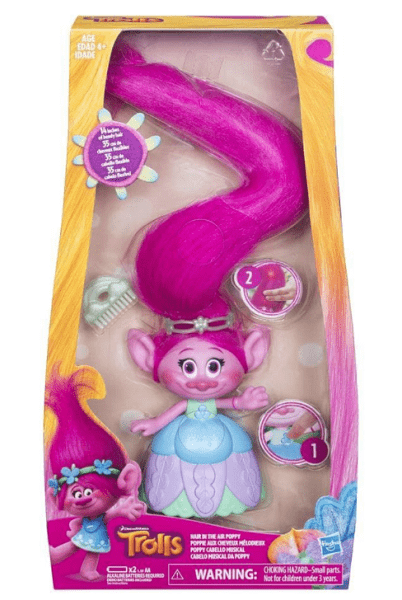 Get her ready for the big celebration and delight in the light from her hair with the DreamWorks Trolls Hair in the Air Poppy doll. Press her gown’s button to see her light up with sound effects. Then, brush Poppy’s hair with the included comb to set off the twinkling lights in the pattern of the brushing. Her soft, pink hair is 14 inches long and bendable, so kids can twist, bend, and create lots of hairstyles. Complete her look with her tiara headband to crown her as queen! • Requires 2 “”AA”” batteries. Demo batteries included. Poppy’s hair is 14 inches alone! That is 14 inches of pure light up, styling fun. She comes with her own styling brush and crown of course. The only thing you might need to add for styling are elastics depending on the style of choice. Poppy’s hair lights up with music playing when you push her special button on her dress. When you style and brush her hair you activate the lights and music as well. Poppy stands on her own so she can be displayed, played with, and stay put while styling her hair. *Character just like in the movie. 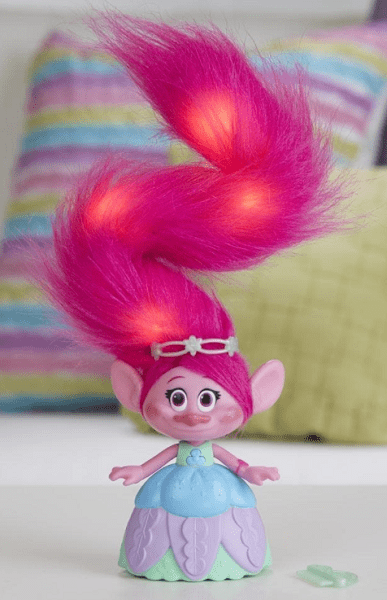 The Dreamworks Trolls Hair in the Air Poppy is adorable, fun to play with, and encourages imaginative playtime which I love. To check out the entire lineup of Trolls products, make sure to visit Hasbro here….